War detectives’ go that extra mile for the fallen servicemen of both World Wars in 2018. The final burial and rededication services of the year have taken place, but the work doesn’t stop there for the commemorations team within the MOD’s Joint Casualty and Compassionate Centre (JCCC), part of Defence Business Services. In fact, the team are equally active between November and March before they travel across the globe ensuring the services currently planned for those who lost their lives during the 2 World Wars are held with the dignity and honour that they rightly deserve, there are approximately 500,000 fallen servicemen still undiscovered. Despite up to a century passing since they fell the remains of British servicemen are still found today, often in farmers’ fields or following civil engineering works. When discoveries are made, the team start the journey of attempting to identify the individual, trace their living relatives before organising a full military funeral service in commemoration. Due to accessibility to research material and the popularity of family genealogy, the team has witnessed a rise in the number of rededication cases submitted identifying previously unknown graves. These last 12 months will live long in the memories of those dedicated few who make up the small team of Gloucester-based ‘war detectives’ a term now regularly used to describe the work of the commemorations team. It was anticipated that this year was going to be demanding, in the lead up to the centenary marking the end of World War 1 in November, however, the scale of public interest surpassed all expectation. This has been an extremely busy, successful and enjoyable year for the commemorations team. More cases than ever have been concluded and we have had some tremendous feedback both from stakeholders and families. This year, to cope with the increase in cases and the significance of the World War 1 Centenary, we took the decision to extend our ceremony window and conduct services well into November. Luckily the weather was glorious, and the moving services we delivered justified this decision. This year had an equal split of 17 burials and 17 rededications spanning 6 European countries. These include a service with Defence Minister, Tobias Ellwood in attendance, who praised the work of the JCCC on Good Morning Britain. 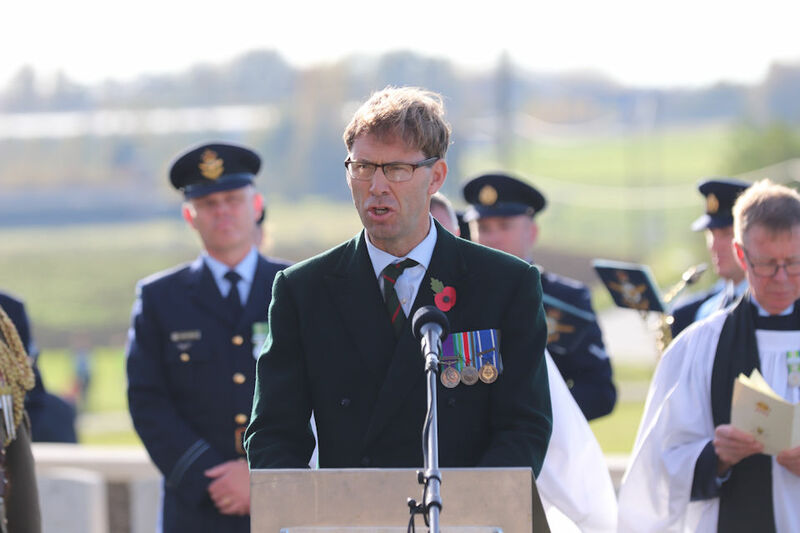 In April a burial service in Belgium for Captain Walker, a New Zealand national serving with the British Army, was attended by his family as well as the current headmaster of his school who all travelled from Australia and New Zealand to be there. One of the most moving moments of the year occurred at the rededication service for Private Lacey Tingle whose 96 year old sister attended having been informed that nearly 74 years after her brother had disappeared, his grave had finally been found. We would like to say a huge thank you to you for all the care and dedication you have shown us. We are still amazed at the marvellous job you all at the JCCC do. It is beyond words how much it means to us to know Lacey’s final resting place. As a regular with 19 years of experience, I confess I had no previous awareness whatsoever of the ‘historic’ role which the JCCC undertake, offering genuine end to end service for our service men and women. I thought I would write to express my thanks at such a well conducted trip both practically (seamless conveyance) and purposely (an incredible appreciative family, bursting to tell everyone who knew them of MOD’s JCCC and their personalised experience). Due to the wintery weather causing the ground to be unsuitable for conducting services, the commemorations team spend time extensively researching cases. This will include visits to the National Army Museum, National Archives and various other research facilities. Also, they plan for the forthcoming year liaising with the regiments and diarising upcoming ceremonies. Between March and July 2019, it is anticipated that the team will have ceremonies for 20 cases, the majority of these taking place in France and Belgium. More services are being scheduled up to November. For a quick overview of this year’s achievements by the Commemorations Team then view the JCCC by numbers (PDF, 198KB, 1 page) 2018 infographic.